Sel Magique® Classic, Spicy, and Salt & Pepper Blends are seasonally produced entirely by hand using traditional Celtic methods to harvest the salt. Sea water from the Atlantic ocean is channeled into a complex system of protected, clay-lined salt ponds. The sea water is slowly solar-evaporated forming a thin crust of delicate, moisture-rich salt crystals, the most prized product from the harvest. The crystals are hand-raked and collected by Paludiers, French salt farmers. This ‘Fleur de Sel’, which translates to English as ‘The Flower of Salt’, is widely regarded as the world’s finest salt for its high mineral content and distinctive, delicate flavor. Artisans then blend our Fleur de Sel with our special recipes of hand-collected herbs and spices, and seal the mixtures to help infuse the herb and spice oils into the salt crystals. 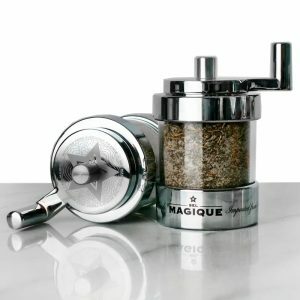 Sel Magique Brands LLC is the exclusive importer of our proprietary Sel Magique Classic Blend, Sel Magique Spicy Blend, and Sel Magique Salt & Pepper Blend. Our salts are hand-harvested in Guérande, France – where Fleur de Sel production dates to Roman rule in the 3rd Century. Our herbs are naturally grown without pesticides and hand-collected in Provence, France. Everything we use in our salt blends is 100% natural. Click here for detailed ingredients. No additives, preservatives, Iodine, or chemicals are added to our fine salt blends, they are 100% natural, unrefined artisanal products. All Sel Magique salt blends are gluten-free, vegan, vegetarian, and are lactose-free. Sel Magique Salt Blends do not contain any genetically modified organisims (GMO). Sel Magique Brands is against GMO ingredients in any of our food products. Sel Magique Salt Blends are produced in accordance with the regulations of kashrut practice. No animal, dairy or cross-contaminations of either foodstuff are used in or near the production or filling equipment during the production of our product. BSE/TSE declaration: all of Sel Magique salt blend’s raw materials used are not of animal origin. The processing and packing material(s) which are used during production repacking or filling of the salt blends does not make contact with meat or dairy products. Sel Magique’s fleur de sel is produced in accordance with National Organic Program (NOP) Standards, European Union regulation (EEC), and EU-Eco-regulation standards, and is 100% organic, and produced from 100% organic ingredients. Herbs, spices and other ingredients are produced with no pesticides, artificial ingredients, or processes. 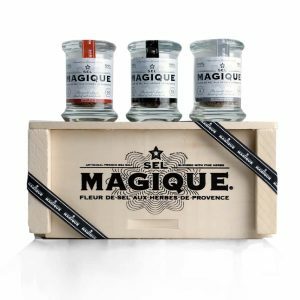 Sel Magique is the exclusive importer of our fine herb and salt blends, and does not sell, produce, or ‘private label’ for any other brand or company. Our 2.4oz votive candles are entirely handmade and intended for small spaces like bedrooms, powder rooms, night stands, on your desk, for travel, etc. The candles are small, so if you’re needing to scent a larger space you’ll want to burn a few candles at the same time. Please burn your candle within sight, and never burn your candle on or near anything that can catch fire. Keep your candle out of reach of children and pets. The candle will of course be warm or even hot to the touch when or just after burning, so please be careful. It is important to trim the wick to 1/4″ each time you re-light your candle – not doing this might decrease the candle’s burn time, overheat the glass and label, and result in smoke. Please don’t burn your candle longer than 3-4 hours each time, again, the glass might become too hot and burn off the fragrance. We use natural soy wax with a generous amount of our hand-blended fragrance oils – the wax might become darker as you enjoy your candle, this is normal. Every order of USD$65+ receives free ground UPS shipping to recipient addresses within the continental USA. Magique Chocolate items are ineligible for free shipping because of their perishable nature, but purchases of $65+ do receive a free Market Tote. We look forward to shipping your order of Magique Chocolate UPS ground (1-day) if the recipient address is within the UPS ground (1-day) zone, shipping from us in 10003. We’re pleased to hand-deliver your order for just $15, usually within a few hours. If you’d like this service, please call us at +800 434 6900, our normal business hours are Monday – Friday, 10am – 6pm.